EXTREMELY FINE GEM. A SUPERB USED EXAMPLE OF THE 1857 PERFORATED ONE-CENT TYPE I. 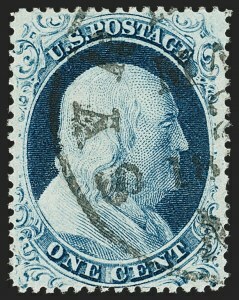 A RARE STAMP IN SUCH SUPERB CONDITION. The defining characteristic of Type I is that the entire design is printed, including the scrolls and plumes at bottom. 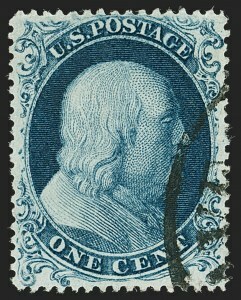 Among the plates used to print imperforate stamps, only one position out of 1,000 can claim that honor (Position 7R1E, Scott No. 5). 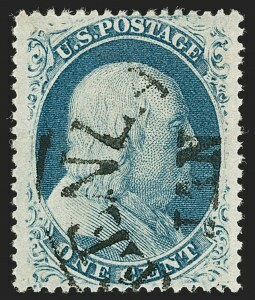 Type I perforated stamps are only known from certain positions on Plate 12. 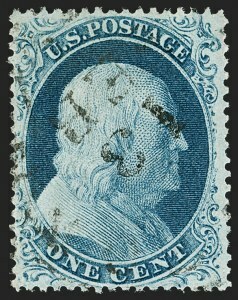 Due to the narrow spacing between perforations and difficulties of production, this issue is usually found with part of the design cut off by the perforations. 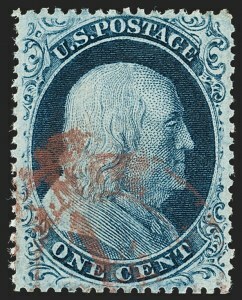 The example offered here, with rich color, a clear cancel and with the design characteristics clearly visible, is a true condition rarity. Ex Merlin. With 2005 P.S.E. certificate (XF-Superb 95; SMQ $7,000.00). This is the highest grade awarded and seven others share it. EXTREMELY FINE GEM. THIS IS WITHOUT QUESTION ONE OF THE FINEST USED EXAMPLES OF THE RARE 1857 ONE-CENT TYPE Ia PERFORATED. 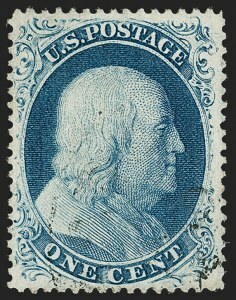 THIS REMARKABLE STAMP IS GRADED XF-SUPERB 95 BY P.S.E. -- APART FROM THE FAMOUS WIDE-SPACED EXAMPLE, THIS IS THE HIGHEST GRADE AWARDED. 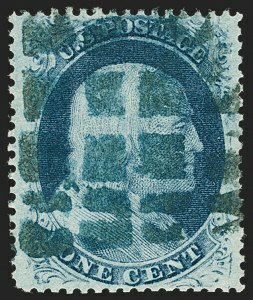 Type Ia stamps were produced from 18 of the 20 bottom-row positions on Plate 4. 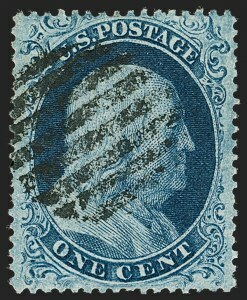 After perforations were introduced in mid-1857, sheets on hand printed from Plates 1 Late and 2 were fed through the new perforating machine, but the narrow spaces between stamps made perforating difficult to accomplish without cutting into the designs. 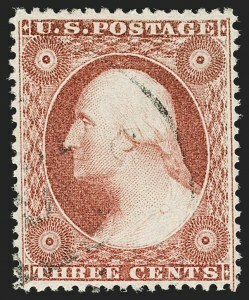 Plate 4 was produced in early 1857 when the introduction of perforations was anticipated; thus, it was entered from a new six-relief transfer roll, and the spaces between stamps were enlarged to allow for perforations. 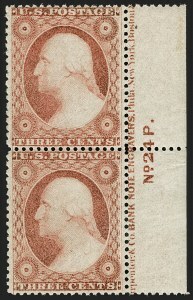 Some Plate 4 sheets were issued in imperforate form (April to June 1857), while the greater portion was issued perforated beginning in July 1857, along with perforated sheets from Plates 1L and 2. Plate 4's most distinctive feature is that the top row (Positions 1-10L and 1-10R) was entered with the designs complete at top (Type II) and the bottom row (Positions 91-100L and 91-100R) was entered with designs complete or nearly complete at bottom (Types Ia and Ic). Although the plate layout provided sufficient space for perforations, the height of the top-row and bottom-row designs was larger than others in the sheet, which resulted in perforations cutting into either the top or bottom rows, depending on which direction the sheet was fed into the perforator. 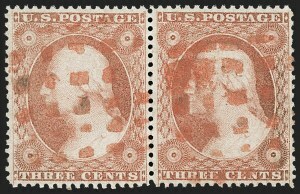 Type Ia and Ic stamps from the bottom row are almost always cut into at bottom, an unfortunate situation for collectors because the bottom part of the design is what makes Type Ia and Ic stamps desirable. 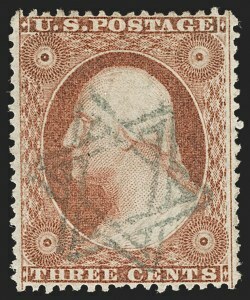 The example offered here, with perforations completely clear of the design and showing the full type characteristics at bottom, is a true condition rarity. Ex Bowman. With 1990 and 1999 P.F. certificates, the former as on cover with two Scott 24 (cover with other stamps accompanies). With 2008 P.S.E. certificate (XF-Superb 95; SMQ $92,500.00). Only one has graded higher (the wide-setting copy, ex Eno, Zoellner, Hinrichs and "Tahoe", graded 98J) and one other shares this desirable grade. EXTREMELY FINE GEM. A SUPERB USED EXAMPLE OF THE 1857 ONE-CENT TYPE III, GRADED XF-SUPERB 95 BY P.S.E. -- PARTICULARLY DESIRABLE WITH THE RED CARRIER DATESTAMP. 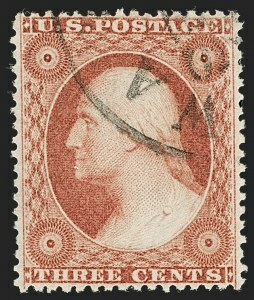 Due to the narrow vertical spacing on this plate, stamps are most typically found with the perforations impinging on a portion of the design. The example offered here is centered so that the type characteristics are clearly visible. With 2011 P.S.E. certificate (XF-Superb 95; SMQ $9,750.00). None have graded higher. VERY FINE AND CHOICE LIGHTLY CANCELLED EXAMPLE OF THE 1857 ONE-CENT PERFORATED TYPE III, CLEARLY SHOWING THE CHARACTERISTICS OF THE TYPE. 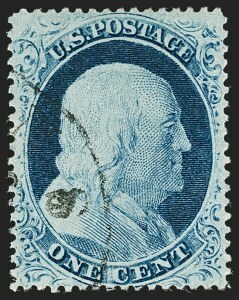 Due to narrow spacing on the plate, examples of this type often have the perforations cutting into the outer lines at either top or bottom or both. The example offered here clearly presents the characteristics of the type, with broken lines at both top and bottom. EXTREMELY FINE GEM. A SUPERB EXAMPLE OF THE PERFORATED 1857 ONE-CENT TYPE IIIa, GRADED XF-SUPERB 95 BY P.S.E. Plates 11 and 12 were probably made in June 1860, with less than six months left in Toppan, Carpenter's contract. 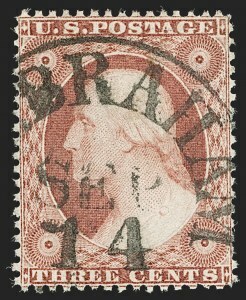 The earliest known use from either plate is January 1861, a relatively short time before the stamps were demonetized. As illustrations of stamps from Plates 11 and 12 in the Neinken book show, the centering and impressions of stamps from these plates were rather poor ("Poor perforating was the rule rather than the exception" -- Neinken book, p. 473). The stamp offered here, with bright color, balanced margins and a light cancel, is truly remarkable. Ex Merlin. With 2005 P.S.E. certificate (XF-Superb 95; SMQ $5,550.00). Only two have graded higher (both 95J). 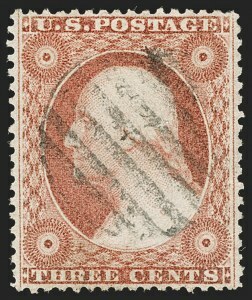 EXTREMELY FINE USED EXAMPLE OF THE 1857 ONE-CENT PERFORATED TYPE IV. A BEAUTIFUL STAMP IN EVERY RESPECT. 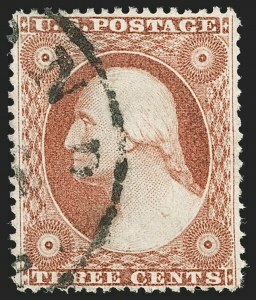 Most examples of this issue have perforations either touching or into the recut lines. 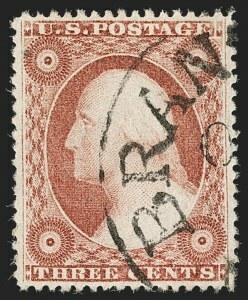 The example offered here, with intact recut lines at top and bottom, is exceedingly rare. It also has uncharacteristically deep color and detailed impression for a Plate 1 Late printing. Ex "Natalee Grace" and Curtis. With 1997 P.F. and 2009 P.S.E. certificates (XF 90; SMQ $3,150.00). Only four have graded higher (all at 95). EXTREMELY FINE. A SCARCE SOUND AND CENTERED EXAMPLE OF THIS BETTER TYPE, WHICH HAS RECUT INNER LINES. Ex Kirke and Curtis. With 2010 P.F. and 2009 P.S.E. certificates (VF-XF 85; SMQ $1,400.00). This is the highest grade awarded. Six others share this grade, but we have never offered any of them. Accompanied by piece from which this originated. EXTREMELY FINE GEM. A STUNNING USED EXAMPLE OF THE 3-CENT 1857 TYPE IV IN THE FINEST CONDITION ATTAINABLE. THIS BEAUTIFUL STAMP IS GRADED GEM 100 BY P.S.E. -- THIS IS THE HIGHEST GRADE AWARDED AND THE ONLY EXAMPLE TO ACHIEVE THIS GRADE. 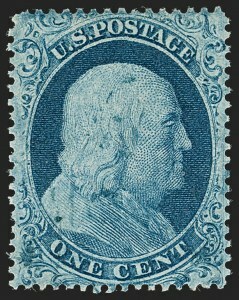 The ready availability of 3c 1851-57 stamps gives collectors the false impression that superb examples, even of a better type, are easily obtainable. 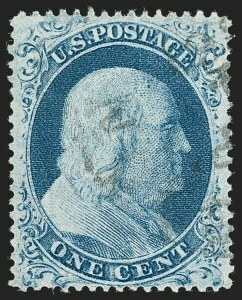 Yet with grading well into its 14th year, this is the sole example of a 3c Type IV stamp to achieve this Gem 100 grade. With 2013 P.S.E. certificate (Gem 100; SMQ $9,750.00). This is the highest grade awarded and the only example to achieve it. No others are even close -- the next highest grade is a 98 (one copy) followed by two at 95J.